“This is how we used to live”, my Pappou (grandfather) said to me, wiping tears from his eyes, “Greeks and Turks together”. We had just eaten some freshly-made haloumi cheese, standing outside Pappou’s old house in Agia Irini, Cyprus. Pappou (Costas) migrated to Australia in 1947 as a 21-year old and had not visited his village in the north of Cyprus since 1972. His two brothers, who remained in Cyprus, both live in the south since the Turkish military intervention in 1974 displaced them and, although the border between the Turkish Cypriot north and Greek Cypriot south was opened in 2003, neither had visited their village since the day they fled from the Turkish military in 1974. It was very significant that Costas was in Cyprus in July 2013. It had been twenty years since he last visited and he had not expected that he would return to his homeland in his old age. At 87, Costas wanted to make the most of his visit. He was determined to make the journey to visit his old village. Much to our surprise, Costas’s brother Andreas decided to come, too. Their younger brother Iordanis was adamant that he would not travel north, as, like many Cypriots, he feels that the experience would be too traumatic and heartbreaking; we understood and respected his decision. Two of his children, however, decided to join us. Costas made the trip accompanied by his two sons, three grandchildren, his brother, a nephew and niece, a daughter-in-law and a sister-in-law. We were a party of eleven (seven from Australia) sharing the two old men’s journey back in time. On Saturday 13 July 2013 we travelled from Polis (in the South of Cyprus) to Agia Irini (Saint Irene), now known as Akdeniz (the white Sea). The village looked very old and worn – underdeveloped. At first, Costas and his brother Andreas were rediscovering their village like two excited little boys; they reminisced about their childhood and giggled with delight. 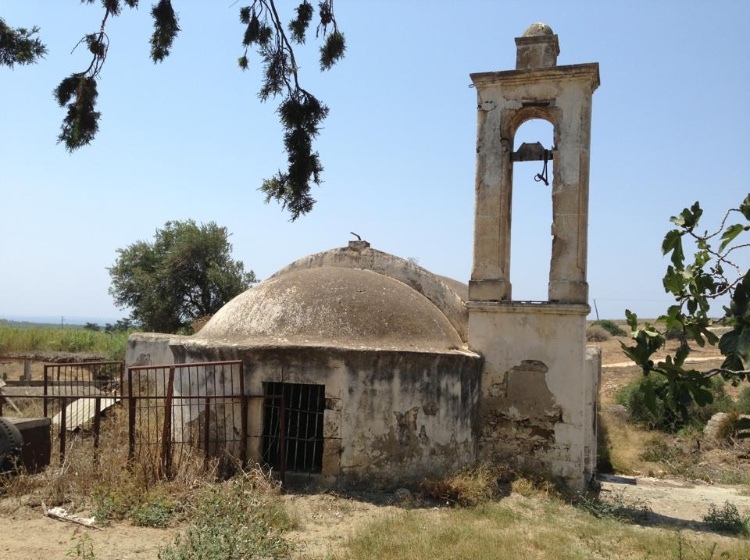 Soon they decided to go down to the old church, where their own Pappou had been the priest. Pappou and his two brothers had felt deeply connected to that church. We followed them as they led us to the small church of Agia Irini, at the edge of the village. It looked quite neglected and as we entered the mood changed very quickly. We realised that the church had been ransacked decades earlier. All of the icons had been ripped from the walls; everything was gone except for the beautiful floor tiles, which were covered in a thick layer of dust. After inspecting the church for a few minutes, Costas broke down sobbing; he was very distraught. His brother Andreas was also shocked and devastated but he reacted positively, defiantly, saying, “I am going to restore this church!” We left the church in a sombre mood. We saw a car driving towards us in the distance and as it came closer we saw my mother, who had become separated from the rest of us shortly after we arrived in the village, sitting in the passenger seat. My mother got out of the car and announced, “I have found Mehmet!” The sombre mood was broken. While we went to the church, my mother had walked towards the mosque, asked for help from some workmen she met, and been directed to, “Go to coffee shop – good English!” She had been trying for a few days to contact Costas’s oldest friend, Mehmet. My family all knew that a reunion of the two men would be the fulfillment of a dream. The kafenion (café) owner, Erol, had responded to her query about an old man who used to live in the village, saying, “Mehmet is my wife’s mother’s brother!” He showered her with hospitality and then went to fetch Mehmet. When mum encountered difficulty in locating the rest of us, Erol drove her around the village searching for us. “I have found Mehmet!” Costas’s expression shifted from pain and fatigue to happy excitement, and he started swiftly up the hill, eager to reunite with his childhood friend. I grew up hearing stories from Costas of how Mehmet and he were closer than brothers. My Pappou would have tears in his eyes and say to me, “I would trust a Turkish-Cypriot over a Greek-Cypriot any day; they are the best friends you could ever have”. 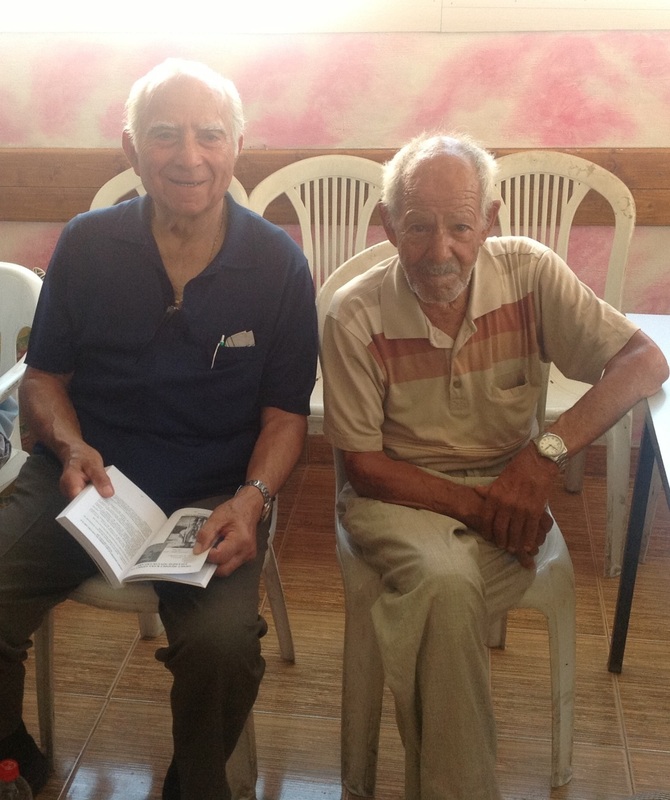 He told me that he and his brothers would play with Turkish Cypriot children, that most of the villagers spoke both Greek and Turkish, and that they embraced each other’s cultural and religious customs and events. At Easter time, the Greek Cypriots would prepare special pastries (flaounes) and coloured eggs and would share these with not only their Greek Cypriot neighbours, but with their Turkish Cypriot neighbours too. After Ramadan, Eid was a Turkish Cypriot feast shared with their Greek-Cypriot friends. They were invited to each other’s weddings and other celebrations, and people were judged on their character ahead of their ethnicity or religion. This was normal life in Agia Irini, a once harmonious, multi-ethnic village. The love and friendship between Costas and Mehmet has lasted throughout the decades and overcome ethnic conflict and separation. 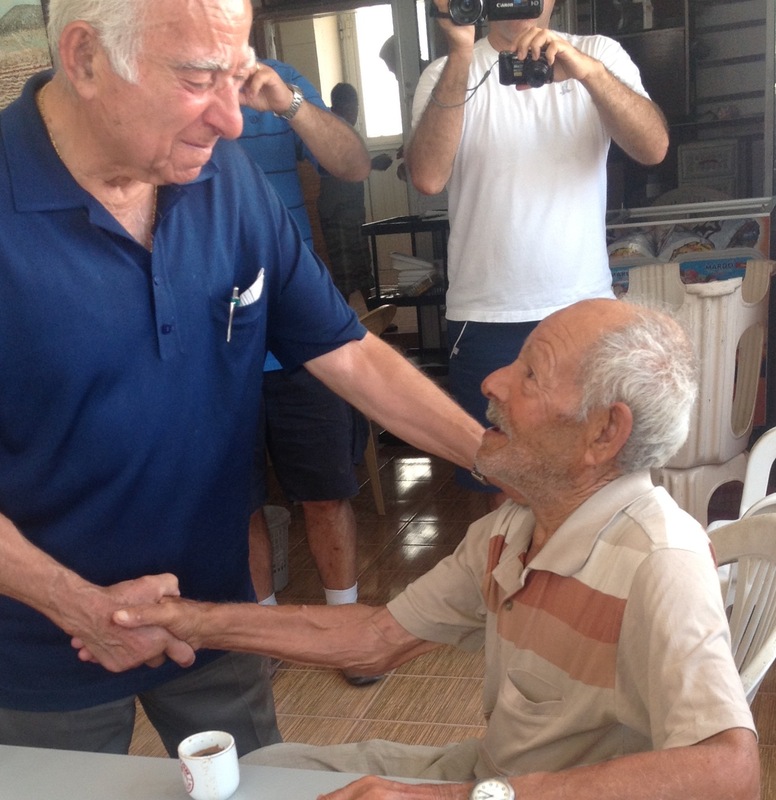 Witnessing their reunion in the kafenion was an extraordinary surprise, a deeply emotional experience and a privilege for all of us. We drank lots of water and coffee, discovered mastica ice-cream and rejoiced in watching the old friends sitting and talking together, reconnecting after all these years. Amazingly, Erol, the owner of the kafenion, was the author of a book on the 2000-year history of the village; he sold quite a few copies that day. Eventually we left and walked back towards our cars. Suddenly, an older lady called out to us – in Greek! Emina had recognised my uncle (my dad’s brother) from his visit to the village in 2011. She remembered Costas and Andreas from decades before and embraced them with much warmth. She called her sister Serpil, who joined the reunion and they told us many stories of the old days of the mixed village, and of how my great-grandfather, Pappou’s father, had died. They introduced us to their children and grandchildren, some of whom now live in the house that had once belonged to Pappou and his brothers. Costas reminisced: “That room is where we used to store the hay…” Serpil opened the room to show us its current use: they make cheese there. She cut up some freshly-made goat’s cheese and sprinkled it with locally collected sea salt; we all sampled it with relish. Then we all had to try the haloumi… and Serpil made up several parcels of cheese for us to take away with us. Iordanis’s two children grew up in the south of Cyprus. They had never met a Turkish Cypriot before. My aunty said to me, “They look like us, and they speak like us!” Her “knowledge”, learned from school and the media, that Turkish Cypriots were very different to the Greek Cypriots, was deeply challenged. I observed her responding to the hugs, kisses and smiles of the Turkish Cypriots with warmth and affection. She told me that she was drawn to them and felt a natural connection to them. I really liked the tone of this biographic blog and am looking forward to the next “chapter”. Obviously a deeply personal tale but told with sensitivity and grace. I love the stories already, I can’t wait to hear more! The flow of your writing is so easy and enjoyable to read. What amazing connections these people had, and how heartwarming to see them last through decades and great distances. I loved your story . Reunions always brings tears to my eyes and yours was wonderful. I do hope the church gets restored one day. nice memory and reunion, recently i visited that village……..